The World Engagement Institute (WEI) is affiliated with a variety of international programs and global initiatives aligned with its mission of academic engagement, international development and institutional capacity building. Many of WEI's associates have been closely operating under the guidance and auspices of United Nations' Programs and Agencies. WEI's subject matter expertise in areas of sustainable international development and sustainable human security share a common theme with the UN mission. Examples of this are the major UN related initiatives which link academic institutions, education and cross-sector partnerships for the promotion of a new culture for social responsibility and global engagement. These programs include the United Nations Academic Impact (UNAI), the United Nations Global Compact (UNGC) and the Principles for Responsible Management Education (PRME). WEI is also a recognized NGO by the United Nations Department of Economic and Social Affairs (UN-DESA) and the United Nations Division for Sustainable Development (UN-DSD). 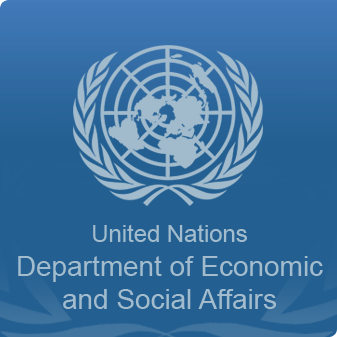 The World Engagement Institute is a member of the United Nations Department of Economic and Social Affairs (UN-DESA). The DESA NGO Branch is the focal point within the UN Secretariat for non-governmental organizations in consultative status with the Economic and Social Council (ECOSOC) and for NGOs seeking status. The office supports NGOs by informing them in a timely fashion on events and opportunities to collaborate with the United Nations. They service the Committee on NGOs, which meets twice a year to discuss accreditation of NGOs to the UN Economic and Social Council. Through CSONet, the office facilitate participation of NGOs to most of the intergovernmental processes taking place at United Nations headquarters and beyond. Each year, some 7,000 NGO representatives participate in those events in New York alone. With the support of the UN Development Account, they carry out limited capacity-building activities with civil society organizations. The NGO branch is part of the Office for ECOSOC Support and Coordination (OESC), a division of the Department of Economic and Social Affairs (DESA) of the United Nations. The World Engagement Institute is part of the United Nations Division for Sustainable Development (DSD). 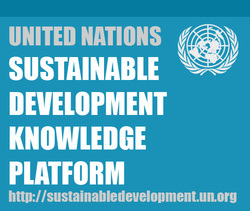 Through various activities and consultations, the Sustainable Development Knowledge Platform aims at promoting and coordinating implementation of the sustainable development agenda of the United Nations. The United Nations Conference on Sustainable Development (Rio+20) which concluded on 22 June 2012, is been considered one of the largest conferences in the history of the United Nations. Governments renewed their strong political commitment to sustainable development and to promote integration and coherence of policies and the implementation of actions in the social, economic and environmental areas. The work of the Division translates into five core functions: (1) Support to UN intergovernmental processes on sustainable development; (2) Analysis and policy development; (3) Capacity development at the country level; (4) Inter-agency coordination; and (5) Knowledge management, communication and outreach. In addition, the Division houses the SIDS Unit mandated to undertake the five core functions enumerated above in support of the further implementation of the Mauritius Strategy of Implementation of the Barbados Programme of Action for Small Island Developing States. 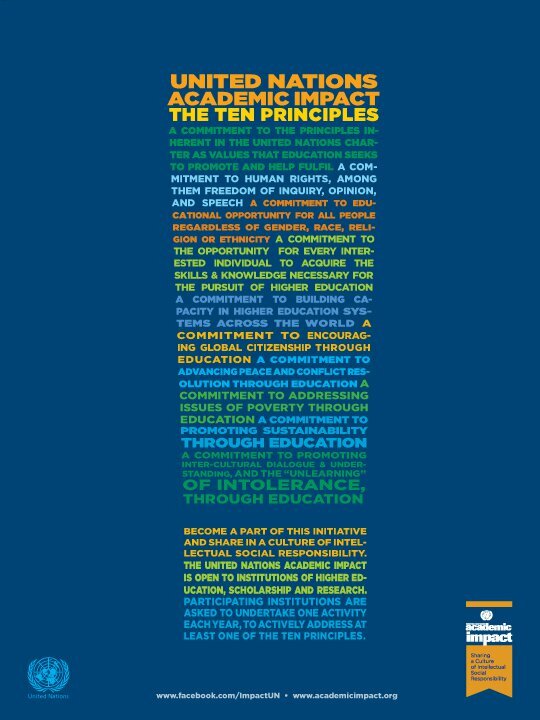 The United Nations Academic Impact (UNAI) is a global initiative which aligns institutions of higher education with the United Nations in actively supporting ten universally accepted principles in the areas of human rights, literacy, sustainability and conflict resolution. UNAI is a United Nations initiative to align institutions of higher education, scholarship and research with the United Nations and with each other. In the words of United Nations Secretary-General Ban Ki-moon: “The Academic Impact aims to generate a global movement of minds to promote a new culture of intellectual social responsibility. It is animated by a commitment to certain bedrock principles. Among them: freedom of inquiry, opinion and speech; educational opportunity for all; global citizenship; sustainability; and dialogue.” (Read more here). Furthermore UNAI aims to support the realization of the Millennium Development Goals (MDGs) focusing on the reciprocal relationship between education and sustainable development. Academic institutions have an invaluable role to play in strengthening the work of the United Nations. The World Engagement Institute, in its academic-based identity and role as connector with numerous academic institutions worldwide aims to promote academic-based sustainable development, academic-social impact and international-global engagement. The UNAI is an initiative formally launched on November 18, 2010 by United Nations Secretary-General Ban Ki-moon. During the inauguration ceremony he outlined the purpose of UNAI in these words: “By sharing ideas, across borders and disciplines, we can find solutions to the interconnected problems that cause so much suffering. Climate change is not just an environmental threat; it is closely tied to poverty. Poverty is not just about jobs, it is directly related to food security. Food security has an impact on health. Health affects generations of children. Children hold the key to our future. And education can lead to progress on all these fronts." (Read more here). 10. A commitment to promoting inter-cultural dialogue and understanding, and the “unlearning” of intolerance, through education. The World Engagement Institute aims to engage a large network of academic institutions on practical and professional international initiatives promoting international sustainable development, sustainable capacity building and sustainable human security. With its identity as "virtual" university and its operations as subject matter expert, WEI works as a catalyst for human, social and institutional transformation for the greater good of society. Its academic-centered methods provide sustainable and institutional solutions to post-conflict societies and transitional societies. Academic institutions, with their primary mission of education, research and service can play a vital role in developing engaged, value-centered and competent leaders addressing the complex problems of our globalized societies. The growing network of academic institutions partnering with WEI find inspiring and innovative international development solutions while promoting global leadership development. WEI represents the UNAI principles by promoting intellectual and academic social responsibility (ASR) not just as an ethical statement but also as a pragmatic option for world benefit. WEI serves academically-based programs and academic institutions to strategically partner in applied and policy oriented research, community and internationally engaged teaching. 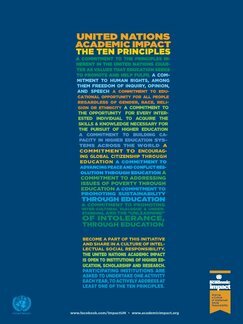 By formally endorsing the UNAI's ten principles, WEI makes a commitment to use education as an engine to address global problems. The UNAI partners with numerous associations of colleges and universities who endorse the principles of the Academic Impact and actively encourage their affiliated institutions of higher education to join the Academic Impact as individual members. See a list here. 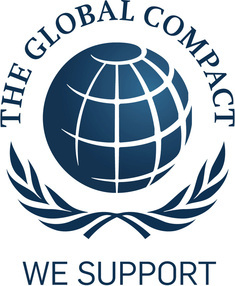 The United Nations Global Compact is a strategic policy initiative primarily designed for businesses in collaboration with civil society, academic institutions and other actors that are committed to aligning their operations and strategies with ten universally accepted principles in the areas of human rights, labor, environment and anti-corruption. Overall, the Global Compact pursues two complementary objectives: (1) Mainstream the ten principles in business activities around the world and (2) Catalyze actions in support of broader UN goals, including the Millennium Development Goals (MDGs). There are seven United Nations agencies behind the UNGC and supporting its work. They are: the Office of the UN High Commissioner for Human Rights (OHCHR), the International Labour Organization (ILO), the United Nations Environment Programme (UNEP), the United Nations Office on Drugs and Crime (UNODC), the United Nations Development Programme (UNDP), the United Nations Industrial Development Organization (UNIDO) and the United Nations Entity for Gender Equality and the Empowerment of Women (UN Women). The World Engagement Institute, as an academically-based non-governmental and non-for-profit organization contributes to promoting the principles and practices inspired by the UN Global Compact. Through our research, programs, projects and international partnerships we promote a integrated approach for developing institutional and leadership capacity for human rights, labor rights, environmental rights and anti-corruption. More specifically, WEI offers a variety of tools and innovative approaches for the promotion of women rights supported by institutional protection and capacity. Other correlated areas of WEI's activities, including international crime-prevention and prosecution, combating human trafficking and sustainable partnerships for international capacity development, clearly align with the Global Compact's ten principles. The Principles for Responsible Management Education (PRME) initiative is a growing network of academic-based institutions that champion the principles (and practices) for a responsible management education, research and thought leadership globally. The PRME are inspired by internationally accepted values such as the principles of the United Nations Global Compact. They seek to establish a process of continuous improvement among institutions of management education in order to develop a new generation of business leaders capable of managing the complex challenges faced by business and society in the 21st century. The World Engagement Institute, with its mission of developing international sustainable capacity worldwide, closely aligns with the PRME. We do so by primarily centering our professional global leadership and institutional capacity development programs on academic social responsibility and community (civil society) engagement. Our vision of developing sustainable, prosperous and secure interconnected societies clearly aligns with the PRME's mission to promote new educational and practical models for ethical leadership and engaged international management development. Most government granted or contracted international development programs are delivered by business that tend to focus on a short term delivery (output) and not much on developing sustainable models and engaged leadership for a long term impact (outcomes). WEI adheres with the purpose of PRME in the attempt to break with the international business-as-usual. The top down approach that most international development corporations often employ must change into a more culturally competent, locally-driven and regionally supported approach. The ethical audit for this new approach must be centered on building on local assets and sustainable outcomes in institutional capacity and leadership engagement. WEI recognizes that the transformation begins with new management education and practices. In the current academic environment, corporate responsibility and sustainable development have entered but not yet become embedded in the mainstream of business-related education. The PRME are therefore a timely global call for business schools and universities worldwide to gradually adapt their curricula, research, teaching methodologies and institutional strategies to the new business challenges and opportunities. Taking the Six Principles as a guiding framework, any institution which is willing to integrate corporate responsibility and sustainable development in a gradual but systemic manner is welcome to join the initiative. We understand that our own organizational practices should serve as example of the values and attitudes we convey to our associates. In the specifics of the World Engagement Institute, we commit to promote these principles to our universities and academic partners worldwide in the purpose of developing sustainable, competent and engaged peoples, manager and leaders committed to make the world a better place. 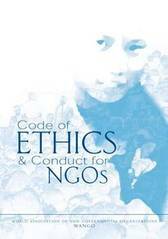 The World Engagement Institute is a supporter of the Code of Ethics and Conduct for NGOs. This is a set of fundamental principles and operational principles and standards developed by the World Association of Non-Governmental Organizations (WANGO) to help guide nonprofit and non-governmental organizations worldwide to ethically and transparently govern their operations. It is also an international NGOs enlisted in the WANGO database.